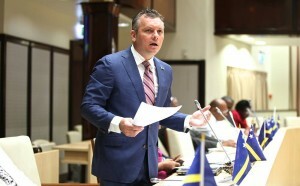 WILLEMSTAD - The new majority in the States adopted two motions against Minister Eugene Ruggenaath of Economic Development and Minister Suzanne Camelia-Römer of Traffic, Transport and Spatial Planning. With these motions, the previous no-confidence motions are emphasized. According to the new majority, which is headed by former Prime Minister Gerrit Schotte these ministers exhibit destructive behavior and there is a wrong and strong attitude, which contributes to a policy that is not for the benefit of the public interest. According to the convicted MFK leader and former prime minister, PAR is selling all public companies under the guise of “strategic partnership”. “There is a policy being implemented in record time to sell all of our public enterprises to Dutch companies. This is done without any form of orientation of who will pay more or if that partnership is actually for the well-being of the island,” said Schotte. As an example, he cites the Marriott Hotel, which was closed after the sale in December for refurbishment but also the Curaçao Dry Dock (CDM) which has a new strategic partner, the Dutch shipping company Damen. These decisions are being taken while the outgoing government no longer enjoys a majority support. “Is this the solution?” asked the MFF leader.